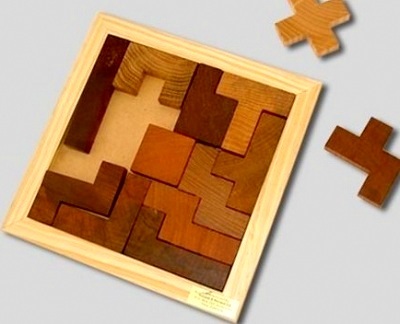 Amazon This puzzle is also know as octogram puzzle. You have 13 or 15 pieces of pieces and you are asked to arrange them on a square chessboard in such a way that they form a perfect chessboard, or known as draught or checkers board. This is actually a type of jigsaw puzzle as you are putting all the pieces together to complete the mission. You'd think there might only be one single solution that exists, but that is NOT true! Here I actually walk you through solving the draught puzzle in C++. To save you trouble I also included the source code below. Scroll down to see it. This is actually a class assignment which asks us to find at least one solution under two hours. I wrote this program in C.
The way the program works is it uses recursion to try and place each piece onto the chessboard in any way possible. It first tries the first piece in some orientation and position, then the 2nd piece in some orientation and position, and so on until it leads to a dead end. Then it tries another orientation or position of the last placed piece, and if it fails again it'll keep trying until all possible orientations and positions run out. Then it removes that piece and try the previously placed piece in different orientation and position. So on and so forth until it finds a solution. If you are quick you'd soon realize that there are several possible optimizations you can do, including stop and try another configuration whenever you find a pocket in the current configuration. I enhanced the program so that it continues finding unique solutions and can stop anytime and pick up from where it left off next time it runs because I was so determined to find the total number of unique solutions, which I believe nobody has yet to find. I ran the program for many hours a day for several days and got more than 16,000 unique solutions! They are unique because no matter how you rotate or transpose them they are different. I discard duplicates. Let me share the source code with you, but if you want to improve your programming skills you should work on it yourself. I thought only a couple of solutions existed because it seems so difficult to find one. Enjoy solving the draught or octogram puzzle! This website helps you translate Chinese into English! This website is for a resort hotel situated in Jiaoxi, Taiwan. This program uses Google API to search for documents similar to the given one. This software allows hundreds of participants to hold a meeting online.